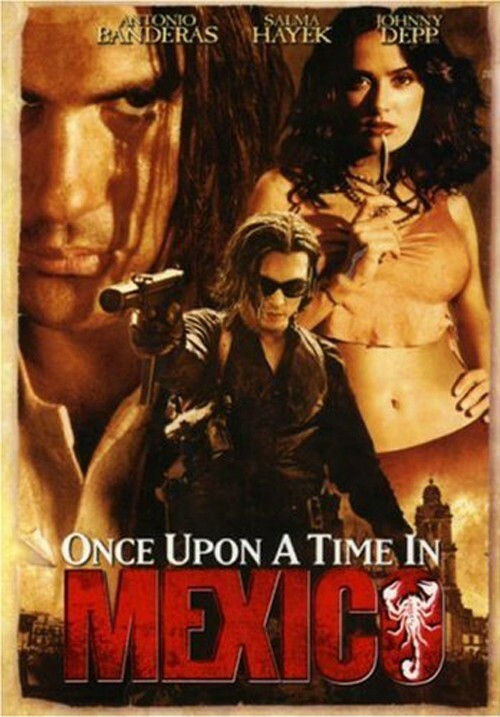 Buy, Rent or Skip Once Upon a Time in Mexico? Once Upon a Time in Mexico looks great on the surface, but it's not without some serious flaws. There are a couple of things that I just don't like in this one. The first thing is William Dafoe. Why is an actor of irish blood playing a Mexican? He just looks odd and creepy looking. Kinda like an actor with a sh*tload of pancake makeup on with a bad fake mustache. It just doesn't look good and draws way too much attention to itself. The second thing is the plot. Where the first two films were simple (....a man seeks to avenge the woman he loved), this one takes that simple plot, but wraps it up in a Government coup d'état with every side playing each other. It's trying to hard to be clever and in the process just becomes incomprehensible, with the 3rd Act just a bit too long for my taste. Lastly, it's the lack of Salma Hayek. Her character is actually killed off prior to the events of Once Upon A Time, and we only see her in flashbacks. Kinda odd that she would even get 2nd billing behind Antonio Banderas, given how little screen time she has here. As always, Robert Rodriguez has a cast of who's who, this time on board is Johnny Depp, Rubén Blades, Eva Mendes, Mickey Rourke and Enrique Iglesias. Both Cheech Marin and Danny Trejo return as well, but they are playing different characters from Desperado. The movie does offer some good moments. Plenty of set pieces and gun fights (although not even in the same class as Desperado). Still worth a Rent for sure. You know, it's funny that you mention Willem Defoe not looking Mexican when the first thing I remember about the movie is that Mexican extra who looks JUST LIKE HIM. It's funny. You're totally right about the thing being too wrapped up and detailed, I agree with that (I actually don't remember much about the movie's plot, most of my memory is Johnny Depp with the missing eyes). I think this was meant to be the "big" film in the style of "The Good, The Bad, And The Ugly" but even that was pretty simple and straightforward. The thing about movies where the protagonist is wrapped up in something like this is he has no big personal stake in it, not like when he's fighting for love or the one big payoff or anything like that. It's like he's a cog in a machine. And people don't want to be cogs in a machine, why would they want to watch movie heroes be that?